Tired of jumping around from app to app? With Mortgage Manager, you can send and receive customized video emails, build drip campaigns, browse client contacts, manage your to-do list, communicate with colleagues and more — all without ever having to leave the software. Everything you need to create and deliver video email marketing is built in. Videos can be recorded, hosted, sent out, and tracked. It’s the ultimate tool for enhancing daily productivity while coming across as polished and professional to your clients in the process. Nurture leads and prospects by creating personalized, one-off video emails tied to specific contacts as they reach different points in the sales cycle. Or, keep clients informed with pertinent updates about their loans. With video email from Mortgage Manager, you’ll never miss out on another opportunity to connect again. Record videos and insert them directly into your reusable drip campaigns. Whether you’re educating your audience on the “do’s and don'ts” of starting a loan transaction, introducing them to your loan team, or talking about the importance of credit repair, Mortgage Manager’s video email feature allows you to stay in front of important contacts at every milestone and touchpoint. Include video in your messages when reaching out to a targeted list of contacts with email broadcasts. From letting clients know when a new loan officer has joined your branch, to weekly market updates, to simply wishing “happy holidays”, video lets you create robust emails that capture the attention of your contacts, helping you to build your brand and increase visibility. 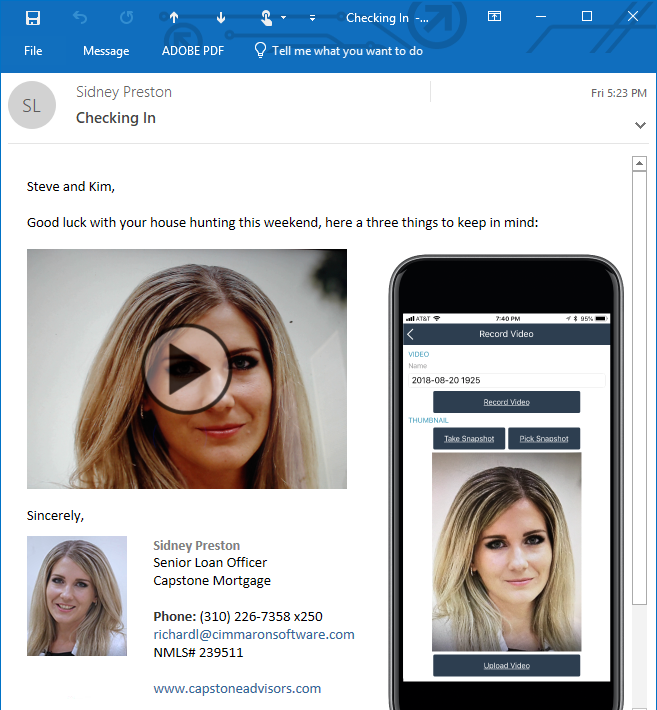 Mortgage Manager’s video email functionality makes it easier than ever before to effectively communicate with past and present customers. Simply record a video of yourself speaking directly to the client, incorporate it into a template with some light text and send out your email — it’s that fast and easy. Send emails directly from Mortgage Manager (no external client necessary). Increase awareness and build brand identity. Respond to timely client communications with face-to-face interactions. Save time by eliminating the need for meetings and phone calls. Create fully customizable videos tailored to the multiple different needs and personalities of your clients. Access Mortgage Manager’s video email function on the go through the mobile app on iOS and Android devices or by logging into the Windows desktop client.